At Horizon, we recognize that a spiritual journey is personal and unique. The unifying goal is that all will grow into a deeper understanding and closer relationship with God. For that reason, we offer two different services distinctly shaped to reflect Horizon’s key values: Exploring and Equipping. The Exploring Service is designed for those who are recently returning to faith, new to faith or just beginning to investigate Christianity. The Exploring Service offers topical themes and spiritual questions relevant to everyday life. Down-to-earth teaching, upbeat music, and creative media help the audience wrestle with topics relevant to everyday life like parenting & relationships, world philosophies, decision making, ethics in the workplace, and the search for significance. Click here to listen to the current Exploring message series. Exploring Services are held on Sunday at 10 a.m. & 11:10 a.m. 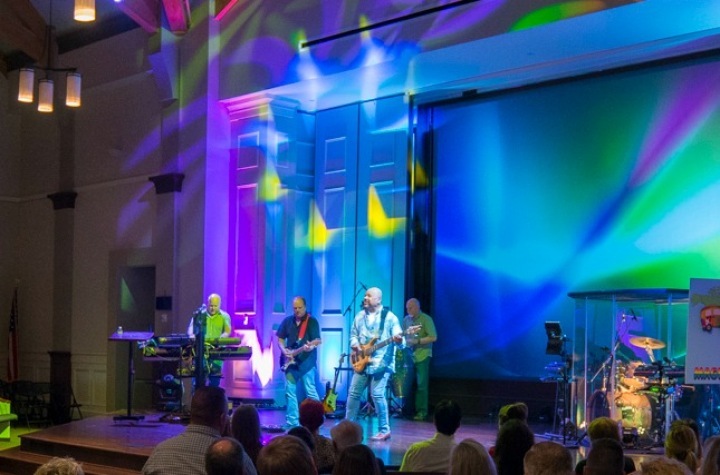 The Equipping Service is designed for those who are maturing in their faith, featuring participatory worship music, times of prayer and reflection, monthly communion, and expository verse-by-verse teaching focused on specific books of the Bible. Click here to listen to the current Equipping message series. Equipping Services are held on Saturday at 4:30 p.m. and Sunday at 8:50 a.m.
Children and Students programming is also held on Saturdays and Sundays. Birth through 6th grade programs are offered during all service times on Saturdays and Sundays. 7th and 8th grade programs are offered during all Sunday service times. High school students meet at Horizon for a large group gathering at 10 a.m. and 11:10 a.m. on Sunday.